Why Do We Complain About Things We Haven't Seen? We’ve all heard these complaints when a trailer or teaser or some spoiler comes out concerning a franchise. Sometimes I even find myself saying these things when it’s a franchise I care about, when it’s concerning something I like. But why? Trailers are often misleading (and sometimes lie outright), teasers barely show anything, and spoilers...well, nobody really knows how spoilers will turn out. They could be fake, they could be real, they could be real but in some completely different context. So why do we complain when the thing we’re complaining about isn’t out yet? When we haven’t actually seen the whole thing? We know that. Just look at Batman v. Superman: Dawn of Justice: nobody (aside from the filmmakers) has seen that film yet, but people have certainly seen Man of Steel and all the previous Zack Snyder films. If you do not like Zack Snyder’s previous films, then it is very likely that you will not like Zack Snyder’s next film. We know what it’s supposed to look like and this isn’t this. This is difficult to get over: for an adaptation, there is always a feeling of “Don’t adapt too little, but don’t adapt too much.” If you adapt too little, you get something like the 1998 Godzilla film, which has almost nothing to do with Godzilla aside from having a giant lizard. If you adapt too much, however, you get something like Zack Snyder’s Watchmen, which is slavishly devoted to the source material and yet manages to miss a lot of the subtext. But what about something like the new Fantastic Four? The trailer looks like it’s wildly different from the comic book and has received criticisms for it. 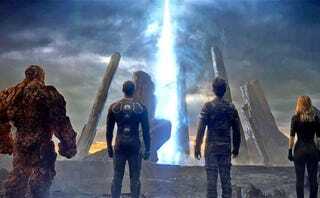 But the two previous Fantastic Four films looked much more like the comic book and they were panned by critics and fans. It’s because we expect that the Fantastic Four be a brightly colored spectacle — it’s written in the DNA of the comics. They are imaginauts. “Dark and gritty” isn’t something that’s associated with the Fantastic Four. I love this franchise and want to protect it. This is the hardest thing to get over. All fans pretty much suffer from this: the feeling that “your franchise” is in danger. That one wrong thing — a bad movie, a bad comic book, a reboot — will destroy the franchise that you love forever. These franchises are often linked with our childhood — we read or watched them growing up, so a “modern” adaptation may feel wrong to us, especially if the trailer doesn’t match the prior expectations in our head. But even if it’s not linked to childhood, it’s still linked to our imagination. We imagined these characters, we lived in their heads, and in doing so, we grow attached to them and want to protect them. But sometimes we have to let them go. Prior knowledge gives us a possibility, but is in no means entirely accurate. Expectations are sometimes good, but can often lead us astray — the current show iZombie is almost nothing like the comic book, but it is entirely awesome in its own right. And the need to protect our imagination is fine, but sometimes comes at the expense of reason. After all, before it came out, there were those who said Guardians of the Galaxy was the death knell of the Marvel Cinematic Universe.